I've fit all the best parts of spring on this delicious piece of toast. 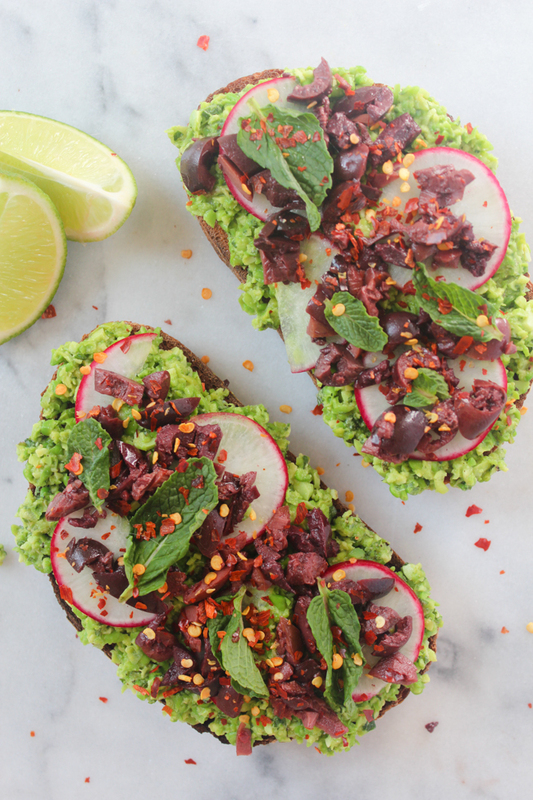 Bright green protein-packed peas and edamame, salty kalamata olives, crisp radishes, hot red pepper flakes, refreshing mint and energizing lime together create such a yummy ode to spring, you're going to want to crunch into this toast right through summer. Warmer weather begs for a meal that's quick, easy and doesn't heat up your kitchen. It' also got to fill you up without weighing you down, because we've all got some serious adventures to get to this time of year. This toast requires nothing more than a whirl of ingredients in your food processor and a bit of prep for toppings; then you're off to the beach, a picnic in the park or afternoon hike. 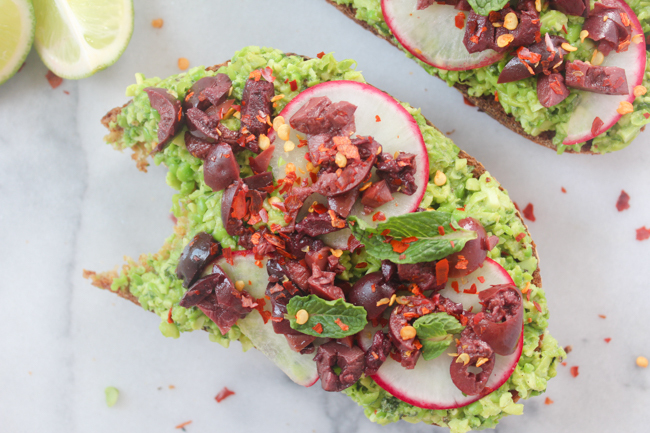 Aside from the deliciousness, gorgeous colors and simplicity of this toast, it's also super energizing and will make you feel incredible. Although I've been a vegetarian for nearly 20 years, I only recently learned about the amazing health benefits of peas. Each cup has 8.5 grams of protein, which is more than twice as much as a tablespoon of peanut butter, and 9 grams of fiber. Peas are also rich in Vitamin B and C, which provide even more energy, and are full of iron. There's a reason pea protein powder has been on the rise, and eating peas that haven't processed is even better. 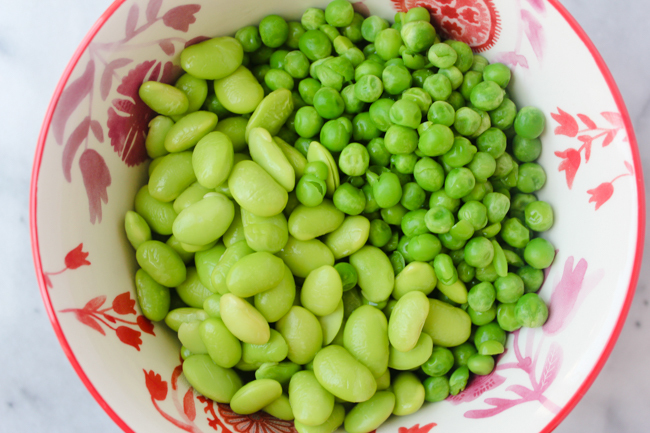 As if that wasn't enough, edamame is also a nutritional powerhouse, that's full of protein, fiber and antioxidants. So basically you can just laugh at anyone who asks you, "Where are you getting your protein?" Alongside my antioxidants, thank you very much. I'd also like to note that I don't include exact measurements in this recipe excluding the pea and edamame purée. Toast is the epitome of relaxed, casual dining and I like for the prep to reflect that as well. 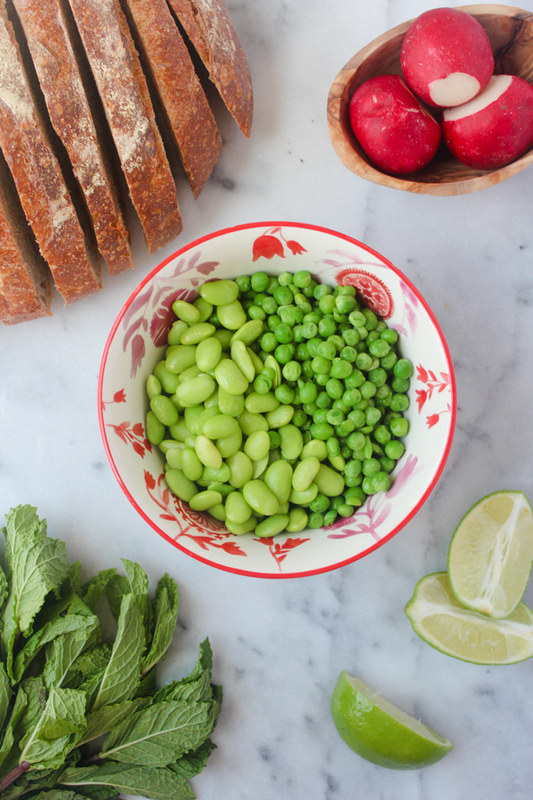 Just grab a large loaf of fresh bread, add the pea and edamame purée, toss on as much of each topping as you want and enjoy. 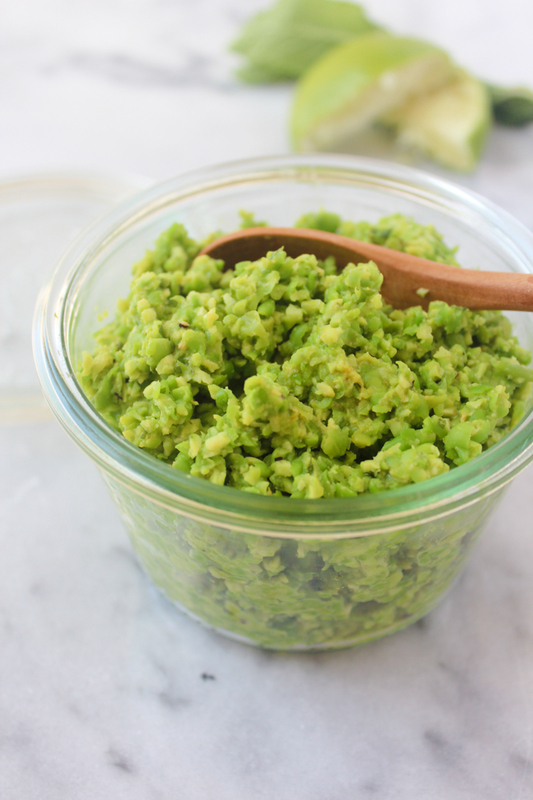 - Add peas, edamame, mint, nutritional yeast, juice of one lime, salt and pepper to a food processor. Pulse a couple times until a rough purée forms that isn't completely smooth. - Top toast with pea and edamame purée, then olives, radishes, mint, red pepper flakes and finish with a generous squeeze of lime. I thought that was avocado at first! You fooled me. Haha. perfect for Spring breakfast and snack! I always love your post. Thanks for sharing! I must try this one day! Avocado would be delicious with the radishes, chili flakes and olives as well! Definitely want to try that now, and you should definitely check out my recipe for the Ultimate Avocado Toast, it's to die for. Thanks so much for visiting! Thanks, Carmen! 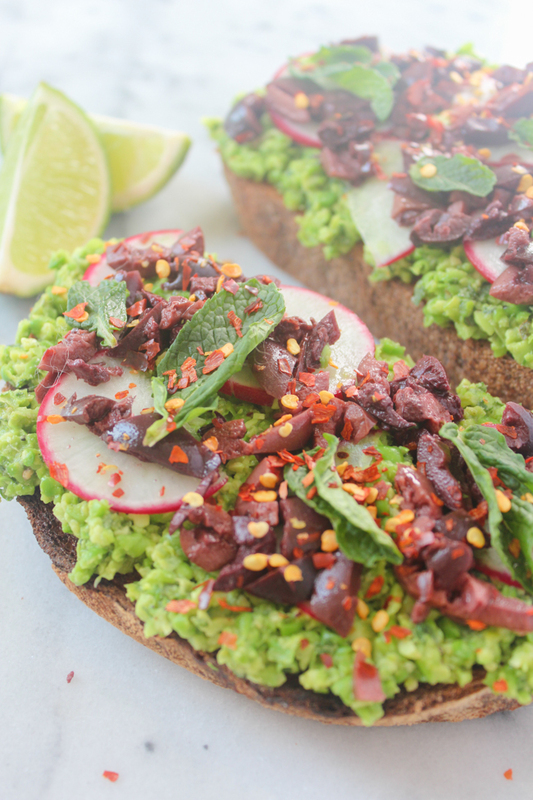 This toast is super yummy and fun for spring/summer. I hope you give it a try and let me know what you think! Thanks so much, Adele! I love your blog as well and am following you! I cannot believe this is edamame, Julia!! Kinda genius girl! I have some in freezer right now! Maybe I will give this a try. And by maybe I mean definitely!! YUM! I always store edamame in my freezer as well! Its so nice to have it on hand whenever you need to add a bit of protein to a dish. Thanks so much for reading and let me know how it turns out! Yes you have to try it! Super yum. Thanks for visiting! Looks better than any avocado toast! I can't wait to try it! Thanks! That's such a huge compliment since avo toast is sooo good hahah :) Let me know what you think! I'm a huge fan of avo toast too! 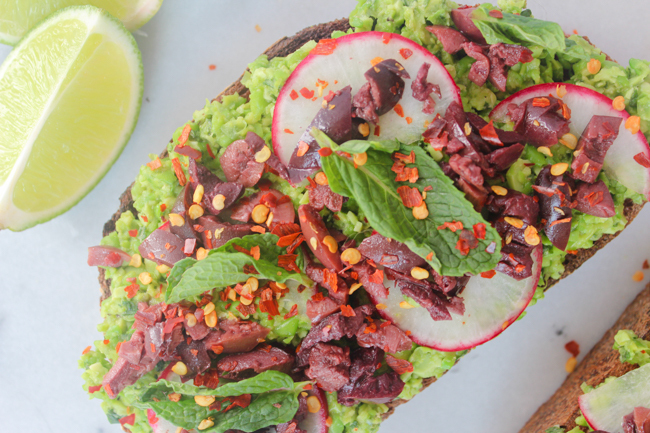 Definitely check out my Ultimate Avocado Toast recipe on my blog, its so insanely good.